…I love BBQ restaurants and you know what to expect when you walk through the doors, so I’m not the hardest customer to please but I knew my mum would be. She isn’t a particularly fussy eater but at the same time she knows what she likes and I know that this isn’t Beef. We’re two very different people! Our Mother & Daughter nights tend to always follow the same routine; we head into Leeds and have a wander around the stores in Trinity and the head up to Yo Sushi for a natter and a fill. You could say we’re creatures of habit. 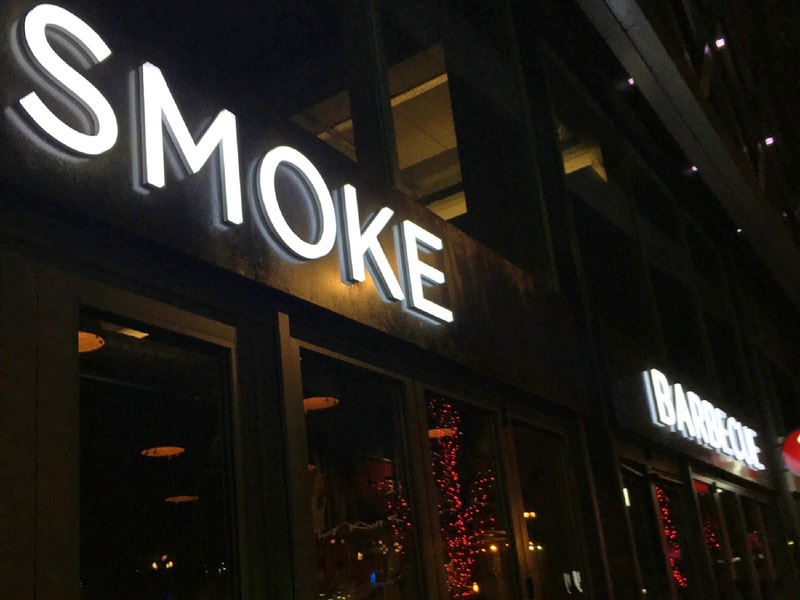 Smoke Barbecue is located at the top of Leeds City centre in the newly formed Arena Quarter. Over recent years Leeds’ Merrion Centre has been a hive of activity as it’s owners have invested time and money in updating the 1970’s mall and exterior and began attracting household names such as Costa & Regis back to the centre. This revival has been inspired by the opening of the First Direct Arena which is conveniently located behind the centre making the Merrion the perfect place to eat before a show. Smoke Barbecue started out in Sheffield back in 2013 after an inspirational visit to Texas, with the aim of introducing the best in smoked, BBQ food and service to the North. From the outside Smoke appears deceivingly compact and cosy, however once inside you are greeted by a deep and lofty space with high, exposed ceilings and the open smoke pit kitchens at the back. The restaurant has been decked out in a fusion of industrial and rustic elements with old washing machine drums used as lightshades and reclaimed wood floors and panelling, creating a very different interior style to other restaurants in the city. The menu offers everything I have come to expect of a BBQ restaurant; a selection of Burgers, Plates and of course Corn Bread alongside some unique draught and bottled beers and my personal favourite; Root Beer. We were treated to a tasted of their three draught beers and Mother Blaze really enjoyed the Freedom Organic Lager, a hand crafter English lager. At this stage I was worried that Smoke may fall short of Mother Blaze’s expectations. But I need not have been. The Smoke team presented us with their Sharer Plate that features a selection of their favourite cuts and that was served with a Jalapeno Corn Bread Muffin, Coleslaw and Twice Cooked Chips. Digging in I saw her eyes light up as she tucked into a succulent Baby Back Rib followed by a chunk of their House Hot Link Sausage. As suspected the Beef wasn’t to Mother B’s taste but she certainly got her fill from everything else on offer. She even took a ‘doggy bag’ home for Pappa Blaze! Although we were both full from the main course we took the opportunity to sample the amazing desserts in offer too and whilst my personal favourite was the S’mores I think Mother B rather enjoyed the Rocky Road Ice Cream! So what happens when you introduce an OAP to BBQ? OAP’s may not be the target market for BBQ restaurants, however, Mother Blaze really enjoyed her night, the food a service was just to her liking and I’m sure she will be telling all her friends on their next girls night out. You can visit Smoke Barbecue in Leeds & Sheffield, with Glasgow opening soon. Are you a Smoke fan?